Denture implants or implant-supported denture uses dental implants to provide a foundation to hold down a denture firmly in place. Dental implants provide a stable foundation for a denture for someone who has lost all of their natural teeth but has enough bone in the jaw to support implants. How can Dental Implants help denture wearers? Poor retention of a lower denture not only interferes with eating but also inhibits social contact, as the denture will dislodge in speech. An implant-supported denture restores function and confidence. It is usually made for the lower jaw because regular dentures tend to be less stable there. The implants also help to stop the bone loss in the jaw that continues once teeth have been removed. Many options are available for retention of the denture, including magnets, clips, bars and balls. For instance, two implants with stud attachments or a bar can be sufficient to stabilize a denture by putting clips into a new lower denture. These clips snap onto the bar and keep the denture from rocking and shifting. Retention problems occur in the maxilla, although less frequently because the hard palate gives better support and retention for a conventional denture. Upper denture implants can give benefit to someone who are unable to tolerate a denture, due to gagging, or who are unwilling to wear a removable appliance. A new complete denture is fabricated if you are not wearing any denture. The denture would serve as a temporary denture before the implant-supported denture is placed. A complete denture wax-up is fabricated to establish the setup of denture teeth for esthetics, phonetics, and vertical dimension of occlusion. 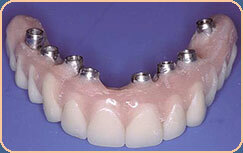 This denture also serves as a template for the location and guidance for placement of implants. Holes will be drilled in the copy of the denture so that the surgeon can see where the implants should be placed. A pre operative radiograph (x-ray) is taken to confirm the bone volume and other oral structures through a panoramic radiograph or computed tomography (CT) scan. An incision is made in the gums and a hole is made in the bone to receive four to six dental implants. The incision is stitched closed. For the first two to four weeks, wearing any prosthesis over the surgical site is not allowed. After the initial healing period, wearing denture with a soft liner in place is preferred. The typical healing time is approximately four months to six months. 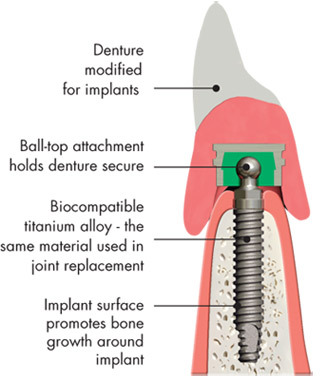 This allows the titanium material and surface of the implant to integrate with the bone. After osseointegration (permanent bond of dental implants with bone) phase, a second surgery exposes the dental implants is done through a small incision on the gums or by removing a circle of tissue using a punch. Then, healing caps are placed on abutments for 10-14 days and the existing denture is retrofitted, with a soft liner, over the implant abutments. The tissue is allowed to heal for six to eight weeks. After the appropriate final abutments are placed, the prosthetic phase of treatment may begin. An impression of your gums and implants is taken, which is used to make the denture framework and teeth. The average time to complete treatment is one year. 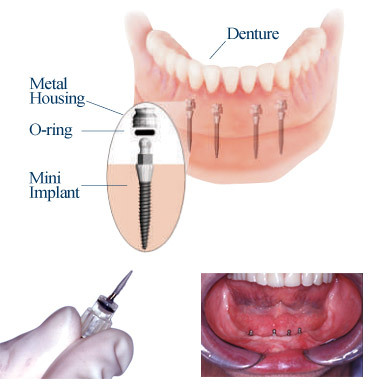 Mini dental implant is a miniature titanium implants that is inserted directly through the overlying gum tissue and into the bone underneath. This involved less invasive, flapless surgery and therefore less chance of swelling, less pain, and faster initial healing times.As a result, post- insertion irritation and soreness is reduced. The procedure generally takes 1-1 1/2 hours. Embarrassment of slipping dentures will be eliminated. 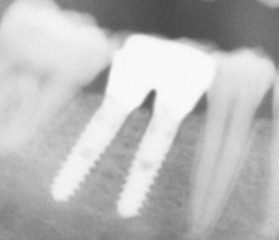 The success rates (implants in place and functional after five years) of implant therapy are approximately 95%. They require meticulous oral hygiene to prevent infection and loss. Poor hygiene can result in infection and loss of the implants. Placement of implants involved a surgical procedure. Any surgical procedure has risks. Infection, reactions to the medications and anesthetics are a couple of complications that can happen. Simple and ease to understand for beginner dental reader.